This range of Crisps does not have a design. They are flavour colour coded and have the flavour written on the bag. A food packaging design could not possibly have any less effort put into it. These Crisps were relatively thick, which gave us a slightly dull munch. The experience was nearer cracker than Crisp, such was the thickness. The crunch did however remain firm and rigid throughout. There was an almost reconstituted look about these Crisps, such was the flatness and evenness of their appearance. The undulations were narrow and even. There was the odd brownish coloured area on what were mostly plain yellow coloured Crisps. A Nose Plunge Test gave us a hint of Vinegar and even a touch of Salt, which is rare - the dominant smell of Salt & Vinegar Crisps is almost always Vinegar. The taste was also a little surprising because although the Vinegar dominated it was not harsh or grimace inducing. 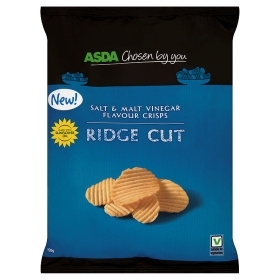 However, although these were enjoyable, a good Salt & Vinegar Crisp should balance both flavours.